The first thing you'll notice about the Shar Pei is that they are quite a dominant breed. Coupled with their intelligence and you own a mind reader! The Shar-Peis are also plagued with a lot of skin issues which more than often is attributed to nutrition or the lack of it. Feeding your Pei the right food could help avoid a lot of these issues and keep their skin healthy and itchy-free. Let's face it, Shar-Pei pet parents suffer as much as their dogs do. In this article, we'll discuss food management and what are some of the best foods for the quintessential Shar-Pei. Let's get to it, but first check out our highest rated top food for Chinese Shar-Pei. This is the best dry dog food to feed a Chinese Shar-Pei, because it has easily-digestible proteins, uses complex carbs and is rich in superfoods and omega 3 & 6 fatty acids for optimum skin and coat health. What to feed a Shar-Pei? In a nutshell, a Shar-Pei should be fed a healthy, natural diet with lean meats. This should be supplemented with other whole ingredients like fruits and vegetables to help maintain overall health, with special attention to ingredients that protect skin and coat health. Finally, take no chances and select foods that don’t include any of the common allergens: soy, corn, wheat, preservatives etc. amongst its ingredients. So let’s break this down further. Meats: All high-grade dog food brands should list meat as their first ingredient. The crude protein on the label should read between 22-26% and fat levels less than 20% and fiber of 4% or less. Since the Pei is prone to gaining weight, we recommend a diet of lean protein such as fish or game. Carbohydrates are also important to a dog’s diet especially to the Pei. Since they are a high-energy breed, carbs provides the adequate energy it needs. Saying that you should buy foods with limited carbohydrates. If your Pei isn’t as active but indulges in a lot of food, then the stored glycogen converts to fat which leads to obesity. Good quality carbs include: barley, oats, brown rice and sweet potatoes. Canned foods contain larger amounts of carbs, so avoid feeding your Pei wet food if you can. If you decide to feed them canned food, mix the two and use a ratio of 3:1 (dry:wet). Most high-quality kibble contain healthy saturated fats like Omega 3 and 6 that work to improve dogs’ skin and coat health, which is important for the Sharpei breed due their skin sensitivities. Since these allergies can be quite severe in the Shar-Pei resulting in intense itching, loss of hair, infected ears etc look for foods that contain healthy sources of fats such as fish oil. Saturated fats are also a healthier source of energy for your Pei than carbohydrates. And, since homemade dog food often lacks in Omega-3’s due to being destroyed through the cooking process, either supplement the Pei’s diet with Omega 3 oils or select a good quality dog food with those ingredients listed. Blends like Farm’s Harvest Adult Dog Food (by Nutro), Solid Gold Wolf King with Bison, and Natural Balance Wild Pursuit Chicken, Turkey Meal & Quail are a few options that can provide a Shar-Pei with the nutrition it needs. These blends include the ingredients needed to help maintain a Shar-Pei’s coat and skin health and avoid using ingredients like grain and wheat that can cause allergies. How many times a day should I feed my Shar-Pei? The Shar-Pei breed doesn’t require a special feeding routine but since they prone to dog bloat, they should be kept on a twice a day feeding schedule. Generally, owners should feed their dog once in the morning and once in the evening. However to help prevent GSD, feeding your Pei several small meals spread out over the day instead of one big meal and avoiding exercise before and right after the meal is a good way to avoid bloat. You know your dogs best and can adjust their feeding as needed, but they should stick to a regular schedule to make sure they are being fed properly. A Shar-Pei should at all times have fresh, cool water available to them. But limit the consumption of large amounts of water right after physical activity to help prevent bloat. How much food to feed a Shar-Pei? The Shar-Pei is a large dog with a big appetite, so they may need to be fed more in comparison to smaller breeds. A Shar-Pei puppy up to the age of 6 months should be fed a specially formulated puppy food formula for large breeds since these contain the right amount of protein, fats, carbs, calories and calcium to phosphorus ratios required for a developing puppy. For a growing Pei puppy the recommended feed is 1 cup per 6 pounds of body weight spread over 3 meals a day and weaning them over 2 meals a day by 6 months old. Feed your adult Shar-Pei according to their age and activity levels. An inactive Pei will require less calories which will help avoid obesity. Also since they are less active in the winter season adjusting their calorie intake will further help avoid any unnecessary weight gain. Feeding instructions on dog food labels provide guidelines as to the amount of calories to feed and it’s a good starting point. However it’s important that you adjust it from there. All dogs are different and the amount they are fed will be affected by their age, weight, and activity levels. Older dogs require a diet adjustment since their activity levels begin to decrease and their susceptibility to develop age-related joint problems increases. A senior dog formula will help prevent your Pei from getting overweight and usually contain higher amounts of protein which is essential to an aging dog. 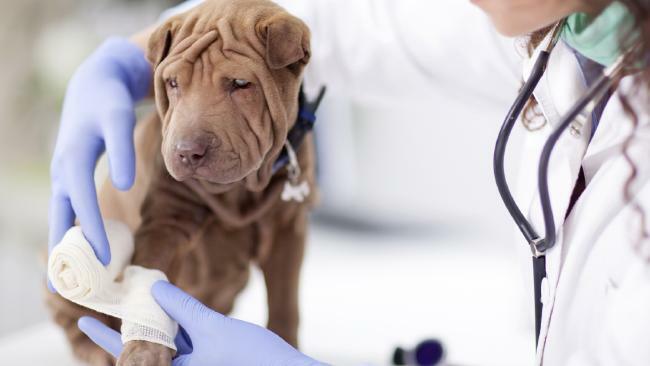 Skin problems and infections are two of the main health problems that owners need to look out for with the Shar-Pei breed. The best way to prevent and treat these issues is with regular cleaning and bathing. In terms of their skin and coat this makes the Shar-Pei a bit of a high maintenance breed, but their owners wouldn’t have it any other way. Owners can also look for dog food with ingredients like Omega 3 and 6 fatty acids that help contribute to a healthy skin and coat. 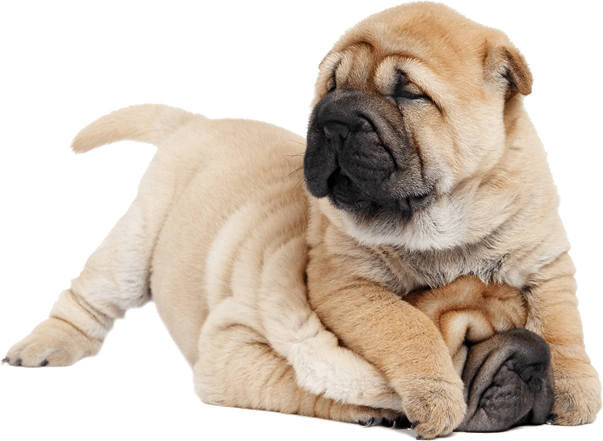 Another issue that the Shar-Pei breed are notoriously known for is Familiar Shar-Pei Fever (FPF), something that occurs on and off with this breed and generally lasts 24 hours. Although this is an inherited ﻿﻿﻿illness and not much can be done about it, owners can feed their Shar-Pei premium dog food with added ingredients for immune support. When it comes to keeping a Shar-Pei healthy and bouncing back from these fevers, healthy ingredients and whole nutrition can go a long way. First Five Ingredients: Bison, Ocean Fish Meal, Brown Rice, Peas, Oatmeal. Solid Gold Wolf King with Bison is a holistic dog food specially formulated to suit the needs of medium and large breed dogs. Real bison, brown rice, and sweet potato has the right mix of digestible proteins and complex carbs to provide Shar Peis with the energy they need to remain active throughout the day. For their immune support, this recipe includes 20 nutrient rich superfoods including: pumpkin, kelp, broccoli, blueberries, cranberries, and carrots. This dry dog kibble uses olive oil, salmon oil, and canola oil as three sources of Omega 3 & 6 fatty acids essential to support healthy skin and shiny coats. Solid Gold doesn’t use any corn, wheat, or soy ingredients that typically trigger allergic reactions in some dog breeds. It has crude proteins of 22%, crude fats of 9% and only 350 kcal per cup. 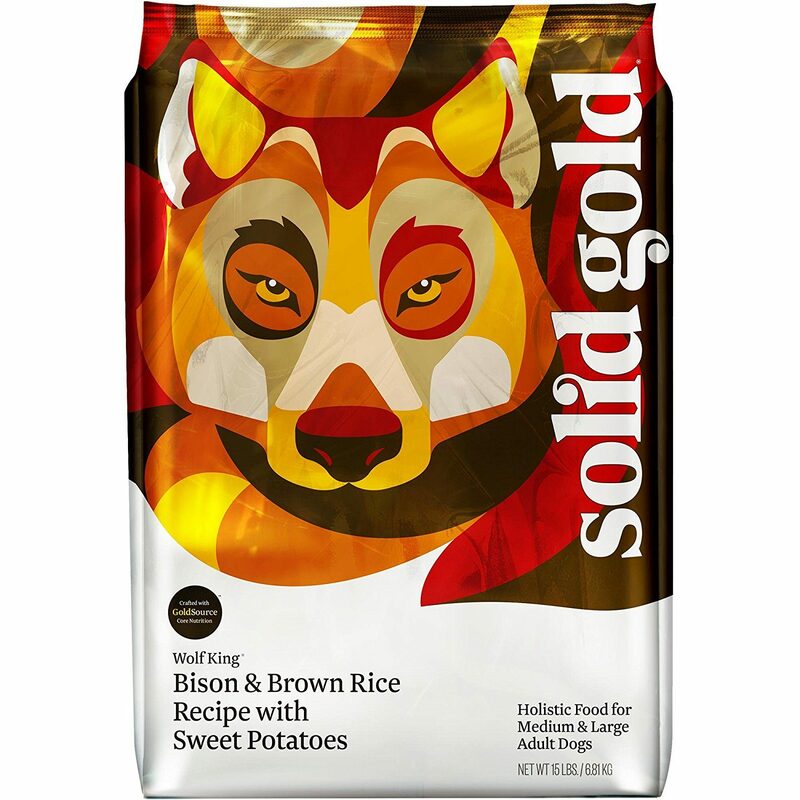 Owners love Solid Gold Wolf King with Bison, Brown Rice & Sweet Potato because their dogs eat well on it and is quite palatable. Dogs who have been switched to Solid Gold have had much better digestion and shinier coats. Overweight Shar Peis will have an easier time losing their excess weight after switching to this brand as noticed by other pet parents. First Five Ingredients: Deboned Beef, Chicken Meal, Turkey Meal, Peas, Chickpeas. Since Shar-Peis require high-protein foods our pick for the best value food is a food that you can feed to your dog regardless of his age since American Journey Beef & Sweet Potato Recipe Grain Free is an all life stages recipe. It is high in protein, uses complex carbs, is grain and gluten-free and has no corn, wheat or soy. This dry kibble formula is very reasonable priced and palatable to dogs. 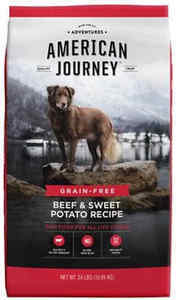 A big plus with pet parents is that American Journey has not no recalls of their dog food and the food is produced in Kansas. It is Chewy’s private label house brand and they’re offering 50% off your first bag! American Journey has several other recipes your Chinese Shar-Pei might enjoy including Chicken, Salmon and Lamb. First Five Ingredients: Chicken, Chicken Meal (source of Glucosamine and Chondroitin Sulfate), Whole Brown Rice, Brewers Rice, Split Peas. 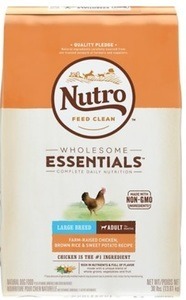 Nutro Wholesome Essentials Large Breed Adult Chicken, Brown Rice & Sweet Potato Recipe Dry Dog Food is made with farm-raised chicken as its first ingredient, supplemented with 100% whole grains for healthy digestion and more energy. The recipe uses whole fruits and vegetables that dogs love like peas, sweet potatoes, carrots, cranberries, split beans, and apples which makes it all so darn tasty! Like most premium dog food brands, NUTRO includes natural fats and oils to promote skin and coat health and a plethora of vitamins. Owners love Nutro Dog Food because it is made in the USA using natural ingredients that they can feel confident feeding their dogs. This includes non-GMO produce only and lean, farm raised chicken. It has 22% crude proteins, 13% crude fats and 3.5% crude fiber, containing 330 kcal/cup. Picky dogs with appetite problems have seen big improvements after switching to this food. Owners remarked that their dog’s weight remained stable when they switched them over to this recipe while minimizing digestion problems too. It contains Glucosamine And Chondroitin vital for a Shar-Pei's healthy joints. This blend is well loved by many large and giant breed dogs containing no by-products, corn, wheat or soy protein, and absolutely no artificial colors, flavors or preservatives. So it’s easy to see why it’s become such a bestseller. Plus, this recipe is blended to provide the adequate nutrition your Chinese Shar Pei needs given it's breed size and daily nutrition requirements. First Five Ingredients: Chicken,Chicken Meal, Chicken Broth,Oat Groats, Pearled Barley. 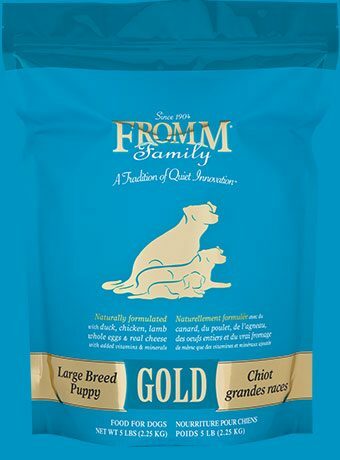 The goal of this Fromm Gold Large Breed Puppy recipe is to provide a balanced and nutritionally appropriate diet which aims to give your Shar Pei puppy with the best in everything it needs to grow strong and healthy. The kibble size is small making it easy for your Shar Pei puppy to eat and digest and they’ll certainly devour it thanks its palatable and excellent ingredients. 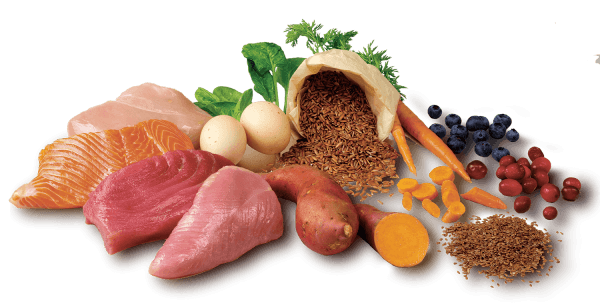 Protein is derived from quality meats such as duck, chicken, lamb and fish. It contains the all-important Salmon Oil and Flaxseed for promoting healthy skin and coat and probiotics to aid digestion. Dry matter analysis is also very impressive with high protein levels of 26%, low fat level of 14%, fiber 5.5% and calories of 384 per cup. Pet parent reviews are also very positive on Amazon with high ratings received for this AAFCO approved large breed puppy recipe. First Five Ingredients: Chicken, Chicken Meal, Turkey Meal, Sweet Potatoes, Chickpeas. 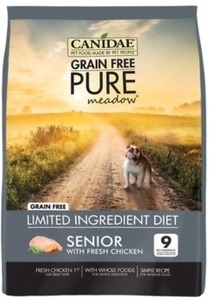 The CANIDAE Grain-Free PURE Meadow Senior Formula with Chicken Limited Ingredient Diet Dry Dog Food is a high quality and popular option with dog owners, which is perhaps the best-selling senior food formula on the market right now especially blended for aging pets with sensitive digestion. This blend main ingredients are: chicken, chicken meal, turkey meal, sweet potatoes and chickpeas. Yummy and all of which will give your aging Shar-Pei the quality protein it needs and in ample amounts too. Since it is a Limited Ingredient Diet blend, this recipe uses just 9 key ingredients which is great for sensitive dogs and contains no ingredients to flare up any issues in your pup's skin or tummy. Crude fat is 10%, crude protein is 28% , crude fiber 5% and calories come in at 409 kcal/cup. The formula is grain-free, gluten-free, has no wheat, corn or soy and has no artificial preservatives and it’s formulated in order to promote a strong immune system. Packed also with vitamins, minerals and a probiotics mix - you don't have to worry about any additional supplements. It’s easy to see why this recipe is regularly ranked as the best dog food for senior dogs. Skin problems, Familiar Shar-Pei Fever (FPF), dog bloat, canine hip dysplasia. Protective, territorial, devoted and independent. One of the rarest breeds in the world, history used for dog fighting and herding. The Shar-Pei, or Chinese Shar-Pei, is a rare breed of dog that can be hard for owners to find at first. Once they are found and well-trained, they make very loyal companions to their family. The Shar-Pei breed often turns heads on the street, as strangers check out their unique wrinkled bodies and large heads. The Shar-Pei breed historically were as Chinese working dogs used for herding, hunting, protection, and unfortunately dog fighting. Today, this breed is active and loves different types of play and exercise. The Shar-Pei breed is best suited for families with children, with their soulful eyes and protective behavior, it's not hard to see why. So let's talk nutrition and make this new addition a long standing and healthy furry member of the family. Wholesome Essentials by Nutro and Solid Gold Wolf King with Bison are both great options for feeding a Shar-Pei. We think you will like these foods. These dry dog kibbles have healthy protein to provide dogs with lots of energy and stamina, plus added produce, minerals, and nutrients to support dogs’ complete health.